After suggestions earlier this week that he could be returning to the team structure he competed with for two seasons, Rui Costa has reportedly signed a three year contract with Team Movistar. The 24 year old Portuguese rider raced as a Caisse d’Epargne rider in 2009 and 2010, playing a team role and also netting several important results. 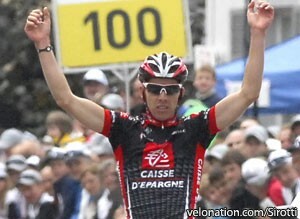 Those included victory in the 4 Jours de Dunkerque and thirteenth overall in the Tour de Suisse, both in 2009. He clocked up three wins last year, namely the Trofeo Deia, stage eight of the Tour de Suisse and the Portuguese time trial championships, and made his Tour de France debut. What looked to be a career that was progressing nicely was threatened, though, when he and his brother Mario tested positive for the substance methylhexaneamine at the Portuguese championships. They were suspended but were allowed to return to racing earlier this year after WADA ruled that methylhexaneamine was now classified as a 'specified substance', and liable to lesser sanction if proven it was ingested accidentally. The brothers said that it was contained in a supplement they were taking, and that it was not listed in the ingredients. Costa told VeloNation earlier this year that he was determined to return and to show what he could do.“My manager is in contact with a few teams and we are trying to figure out where the best opportunities are. I am hoping to return to racing as soon as possible and to show my worth,” he said a month ago. The Portuguese publication abola.pt is reporting that he has secured a three year contract, and that he will make his debut in the new team colours in the Tour of Flanders on April 3rd.